NEXT GENERATION ELECTRONICS: On the electronics front, the Brutale 800 RR features Ride by Wire throttle and four riding modes (Normal, sport, Rain and custom maps), in addition to 8-level traction control and EAS 2.0 gearbox that also manages downshifting. TOP OF THE BRUTALE RANGE: Particular attention was paid to materials and craftsmanship, an exclusive trait of this specific model. This motorcycle features top electronics for maximum performance and safety. ENGINE: The Euro 4 inline-three cylinder engine has undergone extensive technical updating. This engines stands out for its compact dimensions, its light weight and the particular design choices such as the counter-rotating crankshaft that reduces inertia and provides better handling. 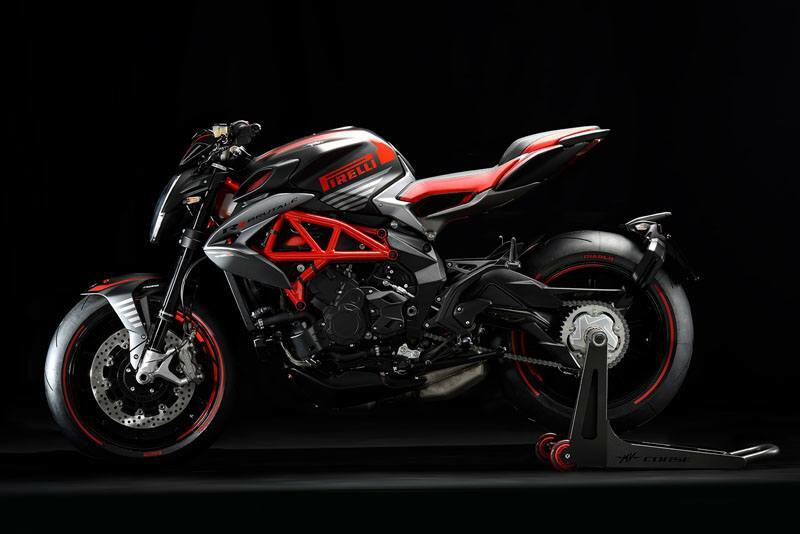 THE SAFEST RIDE: For MV Agusta, safety and performance go hand in hand: for this reason the Brutale 800 RR has two-channel ABS 9 Plus, small and lightweight but packed with useful features for a sport bike, such as RLM (Rear Wheel Lift-up Mitigation), a system that controls the pressure applied on the front brake to avoid involuntary rear wheel lift-up. SPECIAL DETAILS, FOR A SPECIAL SERIES: Seat seams matching the colour scheme, black front headlight support, and black seat frame and airbox intake screens. The wheels are the same as on the superbike F4, with a 6″ channel on the rear wheel. 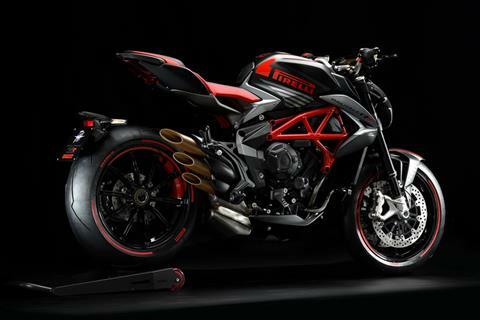 PERFECTION IN EVERY DETAIL: Every detail about the Brutale 800 RR Pirelli is about performance. That of a pure racer. To make the riding experience even more exhilarating, it features the same signature wheels as the F4. Their advantage is their light weight. IT’S AN RR! : The first proposed colour scheme has a matt black base, with shiny red inserts. The Pirelli logo on the tank’s side is also red. The Diablo logo, identifying Pirelli’s high performance tyres, stands out on the tank. Separated liquid and oil radiators. Rear - Progressive Sachs, single shock absorber with rebound and compression damping and spring preload adjustment; Aluminium alloy single sided swing arm; Wheel Travel - 4.88 in. (124 mm).